What if you could run your air conditioner not on conventional electricity, but on the sun’s heat during a warm summer’s day? With advancements in thermoelectric technology, this sustainable solution might one day become a reality. But scientists are hoping to design more powerful thermoelectric devices that will harvest heat — produced as a byproduct of industrial processes and combustion engines — and turn that otherwise wasted heat into electricity. However, the efficiency of thermoelectric devices, or the amount of energy they are able to produce, is currently limited. Now researchers at MIT have discovered a way to increase that efficiency threefold, using “topological” materials, which have unique electronic properties. 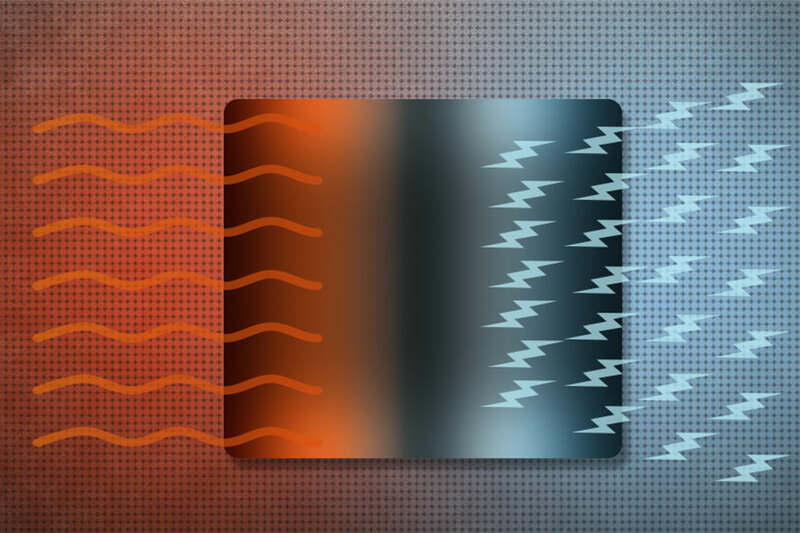 While past work has suggested that topological materials may serve as efficient thermoelectric systems, there has been little understanding as to how electrons in such topological materials would travel in response to temperature differences in order to produce a thermoelectric effect. In a paper published this week in the Proceedings of the National Academy of Sciences, the MIT researchers identify the underlying property that makes certain topological materials a potentially more efficient thermoelectric material, compared to existing devices. Liu is first author of the PNAS paper, which includes graduate students Jiawei Zhou, Zhiwei Ding, and Qichen Song; Mingda Li, assistant professor in the Department of Nuclear Science and Engineering; former graduate student Bolin Liao, now an assistant professor at the University of California at Santa Barbara; Liang Fu, the Biedenharn Associate Professor of Physics; and Gang Chen, the Soderberg Professor and head of the Department of Mechanical Engineering. Scientists have observed that some topological materials can be made into efficient thermoelectric devices through nanostructuring, a technique scientists use to synthesize a material by patterning its features at the scale of nanometers. Scientists have thought that topological materials’ thermoelectric advantage comes from a reduced thermal conductivity in their nanostructures. But it is unclear how this enhancement in efficiency connects with the material’s inherent, topological properties. To try and answer this question, Liu and his colleagues studied the thermoelectric performance of tin telluride, a topological material that is known to be a good thermoelectric material. The electrons in tin telluride also exhibit peculiar properties that mimick a class of topological materials known as Dirac materials. The team aimed to understand the effect of nanostructuring on tin telluride’s thermoelectric performance, by simulating the way electrons travel through the material. To characterize electron transport, scientists often use a measurement called the “mean free path,” or the average distance an electron with a given energy would freely travel within a material before being scattered by various objects or defects in that material. Nanostructured materials resemble a patchwork of tiny crystals, each with borders, known as grain boundaries, that separate one crystal from another. When electrons encounter these boundaries, they tend to scatter in various ways. Electrons with long mean free paths will scatter strongly, like bullets ricocheting off a wall, while electrons with shorter mean free paths are much less affected. In their simulations, the researchers found that tin telluride’s electron characteristics have a significant impact on their mean free paths. They plotted tin telluride’s range of electron energies against the associated mean free paths, and found the resulting graph looked very different than those for most conventional semiconductors. Specifically, for tin telluride and possibly other topological materials, the results suggest that electrons with higher energy have a shorter mean free path, while lower-energy electrons usually possess a longer mean free path. The team then looked at how these electron properties affect tin telluride’s thermoelectric performance, by essentially summing up the thermoelectric contributions from electrons with different energies and mean free paths. It turns out that the material’s ability to conduct electricity, or generate a flow of electrons, under a temperature gradient, is largely dependent on the electron energy. Going one step further in their simulations, the team played with the size of tin telluride’s individual grains to see whether this had any effect on the flow of electrons under a temperature gradient. They found that when they decreased the diameter of an average grain to about 10 nanometers, bringing its boundaries closer together, they observed an increased contribution from higher-energy electrons. That is, with smaller grain sizes, higher-energy electrons contribute much more to the material’s electrical conduction than lower-energy electrons, as they have shorter mean free paths and are less likely to scatter against grain boundaries. This results in a larger voltage difference that can be generated. What’s more, the researchers found that decreasing tin telluride’s average grain size to about 10 nanometers produced three times the amount of electricity that the material would have produced with larger grains. Liu says that while the results are based on simulations, researchers can achieve similar performance by synthesizing tin telluride and other topological materials, and adjusting their grain size using a nanostructuring technique. Other researchers have suggested that shrinking a material’s grain size might increase its thermoelectric performance, but Liu says they have mostly assumed that the ideal size would be much larger than 10 nanometers. “In our simulations, we found we can shrink a topological material’s grain size much more than previously thought, and based on this concept, we can increase its efficiency,” Liu says. Tin telluride is just one example of many topological materials that have yet to be explored. If researchers can determine the ideal grain size for each of these materials, Liu says topological materials may soon be a viable, more efficient alternative to producing clean energy. “I think topological materials are very good for thermoelectric materials, and our results show this is a very promising material for future applications,” Liu says. This research was supported in part by the Solid-State Solar Thermal Energy Conversion Center, an Energy Frontier Research Center of U.S. Department of Energy; and the Defense Advanced Research Projects Agency (DARPA). Be the first to comment on "Topological Materials Boost the Efficiency of Thermoelectric Devices Threefold"